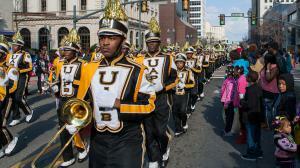 Experience everything Shreveport-Bossier City has to offer this Mardi Gras season. 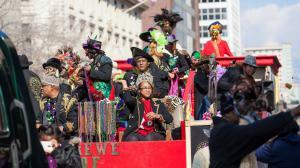 Fat Tuesday is right around the corner and Mardi Gras season is already in full swing, but before you head to your first or fiftieth parade, make sure to check off all of the essentials to laissez les bon temps rouler this carnival season. 1. Eat a King Cake- whether your preference is traditional or something with a twist, the options in Shreveport- Bossier City abound! Buttercups Cupcakes makes an individual sized cupcake version, perfect for parade snacking. 2. Eat a Muffaletta- there may not be a more perfect meal option than the muffaletta! Fat Tuesday Sandwich Shop & Bakery makes a muffaletta melt po-boy, while Fertitta’s Delicatessen offers a smaller single serving version appropriated called, “The Muffy”. 3. Catch a Throw- But not just any type of throw. Bring your appetite to the Krewe of Harambee Parade because you can catch a foil-wrapped hot dog, tossed by the Krewe of Bar-B-Que. 4. Wear your Parade Finest- visit the much-loved Tubbs Hardware Cajun Gifts and King Cakes and stock up on your parade gear. 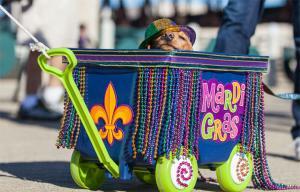 From beads and boas to festive attire and everything in between, you’ll be the envy of parade goers. 5. Take Home A Unique Souvenir- The Enchanted Garden creates beautiful, hand-painted Mardi Gras masks and other collectibles, jewelry and home goods that make for memorable souvenirs. 6. Celebrate with a Libation- the hurricane is a classic cocktail that many typically associate with a good time in Louisiana. Grab a hurricane and take it to-go from BeauxJax Crafthouse located in Bossier City’s East Bank District.